Do you know that you can evaluate the safety condition of the floor by measuring its slip resistance? I learned about that last week in my Civil Investigation class. Our topic was on premises liability, particularly, floor accidents (trip and fall and slip and fall). Prof. Seamon brought to class a portable machine called the English XL Variable Incidence Tribometer. By using the machine, you can measure the floor surface's slipperiness to determine whether it is safe to walk on or not. 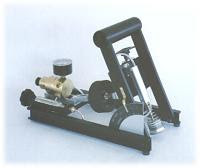 The machine can be used to test wet or dry surfaces. The professor also brought with him samples of floor tiles used in commercial establishments like hotels, stores, malls. After the classroom discussion and demonstration, we went out the hall to test the different floor surfaces of the law school. The standard static co-efficient of friction of a safe dry surface and the standard slip resistance of a wet surface is .5. Buildings and places open to the public should, therefore, make sure they meet this standard to avoid getting into legal trouble in case somebody slips and hurts himself within its premises. So next time you go window shopping, and you slip and hurt yourself (without your fault), you know what to do.